This thread contains general information about the AOR F1 Leagues on all platforms (XB1, PS4 and PC), such as league structure, assist restrictions and lobby settings. ● League setup: Each platform runs a set amount of leagues, depending on the amount of drivers signing up at the start of the season. The leagues are tiered, with the aim to have the faster drivers in the higher leagues and the slower drivers in the lower leagues. ● Race format: Each race event features an 18-minute qualifying session followed by a 50% distance race. Practice sessions may be arranged independently within each league. ● Day/time: All league events will take place on Sunday nights from 8:00pm (UK time). The leagues on each platform are placed into a tier structure, with the higher tiers aimed at the fastest and most skillful drivers, and the lower tiers aimed at slower and less experienced drivers. The below graphic shows the current tier structure and which assists are available to be used in each. Note that the amount of tiers in the 2nd bracket depends on the amount of drivers signing up at the start of the season. This structure applies for every platform - XB1, PS4 & PC. When setting up the leagues for a new season, we always aim to make the leagues as close and competitive as possible, by placing drivers where they best fit into the league structure in relation to their pace. With this being a new season on a new game, both returning and new drivers will be placed in leagues based on the times submitted in the official time trial event, as well as race pace data from the mandatory pre-season evaluation races (this only applies for pre-season sign-ups). Experience from previous season(s) may also be taken into consideration to some extent, but less so than usual. More information about how the time trial event and evaluation races will be conducted can be found in the respective threads. Each league will generally allow a full grid of 22 drivers (plus reserves), although Tier 1 leagues may be limited to 20 drivers in order to accomodate live broadcasters, if this can be arranged. Due to table limitations, reserve drivers will not be visibly listed in their league's standings. However, the table keeps record of their points in the background, so that if they later get promoted to a main race seat (if one of the main drivers drops out or is removed), points scored during the reserve driver period will be added to their total points count. Unlike main drivers, reserve drivers are not required to be online at the time of the races, but this is obviously appreciated. It's a good idea to keep an eye on the forum before the races to see if any no-showers are announced. If a league ends up in a situation of severely lacking driver numbers, appropriate drivers from the league(s) below may be asked to move up to balance the numbers. Preferably we want to avoid having to move drivers between leagues against their will, but in extreme situations this can be a necessity for the sake of keeping the leagues competitive or sufficiently filled up. In the event of a driver being moved to a higher league with tougher assist restrictions, the driver will have to adapt accordingly. Cars and teams will be decided individually within each league at the start of the season. When the car selection begins, a thread will be created within each league's subforum with more information about how the process is practically carried out. 1. Top 3 finishers from the top tier in Season 11, sorted in championship order. 2. Drivers who were part of a league at the end of Season 11, sorted from fastest to slowest combined time from the time trial event. 3. Drivers who were not part of a league at the end of Season 11, sorted from fastest to slowest combined time from the time trial event. The car selection process concludes when all drivers within the league have a car and teammate assigned. Once the first race has taken place, no car changes will be allowed at any point during the season. Intentionally using the wrong car in an attempt to benefit yourself or others in a race will see you disqualified from the results of that race. *Setting under review - will be off for at least the first 3 races. 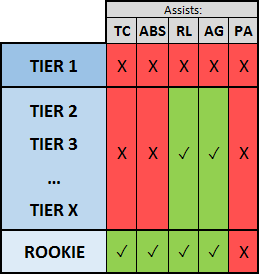 Assist restrictions are depending on the league's tier - refer to the tier structure here. Drivers who complete more than 90% of the race before accidentally crashing out or getting disconnected will be classified as a finisher, but only in the position the game awards them at the end of the race. Points will then be scored as per the system above. ● If a driver loses connection during qualifying or the race, they are allowed to rejoin the lobby through a pre-session invite should they have one still active. ● Note that the game currently doesn't allow coordinators to send fresh invites to drivers after the qualifying session is already underway, so if you don't have a working pre-session invite after dropping out, it may not be possible to get back in, in which case it's tough luck unfortunately. ● We do our best to ensure that the best available connection in the lobby acts as the lobby host, so that any connection issues are most likely a result of a fault on the disconnecting driver's end. Please ensure that your internet connection is in an optimal state - and that your NAT type is open - before entering the race lobby. ● During qualifying, if 4 or more drivers lose connection to the lobby and are unable to get back in, then the lobby will be restarted and qualifying run again from scratch. ● During the race, if half (or more) of the drivers in the lobby lose connection at the same time, or over a short period of time, that counts as a mass disconnection. A "short period of time" would generally mean a couple of minutes, up to a maximum of 5 minutes. ● If less than 50% of the race was completed at the time of the mass disconnection, the race will be restarted immediately, preferably with a new lobby host. The new lobby will be created without another qualifying session, as a manual rolling start will be performed in order to get cars back into their original positions. Parc Ferme rules will be set to 'Off' so everybody can load their setup. The first 2 laps will be seen as 'formation laps' where every driver needs to safely get into their original qualifying position, using the same tyre compound as they did in qualifying. A slow pace is asked for (similar to a normal formation lap), so that no accidents happen and all drivers can obtain their qualifying position safely. The pole sitter will have the role of setting an acceptable pace, in order to avoid crashes behind him and to allow everyone time to get into position. Failing to get into your qualifying position, or preventing another driver from getting into their position, will result in a penalty for the driver at fault. The race is started when the pole sitter crosses the start/finish line at the start of lap 3. Remember that all of our staff are dedicating their free time to help run the leagues, so although we'll try to answer questions and concerns as soon as possible, please don't take it the wrong way if we sometimes take some time to respond.